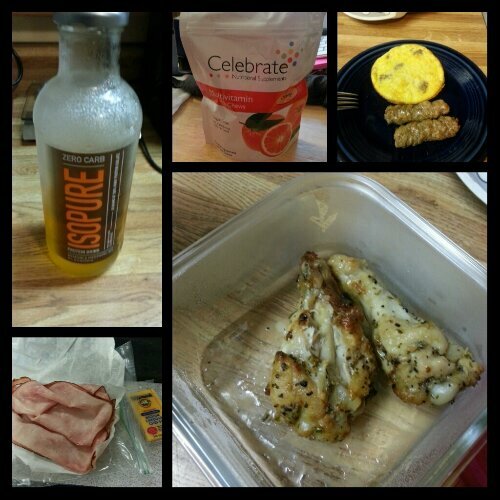 Today’s food choices, from upper right: mini turkey sausage and egg omelet with Applegate Farms pork sausage links; baked chipotle lime marinated drummettes; DaBecca maple honey ham with Tillamook cheddar cheese snack; Isopure Zero Carb; multivitamin x2. I totally failed at snapping my lunch (crockpot chicken fajitas) and the walnuts I ate that made me ill.
I’d packed my lunch and snacks for today last night before I went to bed so that I could just grab my lunch bag on the way out the door this morning. I’d bought a container of walnut halves last week at the store thinking that now I’d been cleared to eat “anything I wanted” (the PA’s words), I could have some nuts as a snack. Boy was I wrong. I didn’t realize just how wrong I would be until this morning. I’d just finished teaching my first class of the day and it was nearly time for my morning snack. Since I eat breakfast a full hour and a half earlier than I used to, I have a snack around 9:30-9:45 so that I’m eating something about every three hours while I’m awake. This gives me time to get in adequate amounts of fluid as well. I decided to pull the half-ounce bag of walnuts out of my lunch bag and snack on them. I sat at my desk, and popped half of one of the halves in my mouth, chewed thoroughly, swallowed and waited. When nothing notable happened, I ate another. Then, my GI tract began to revolt quietly. My stomach became unsettled, and my mouth began to salivate heavily. Salivating incessantly is my body’s way of warning me that puke is on its way and that I’d better be close to a sink or things will get ugly fast. I sat very, very still, hoping that the flow would stop. When it didn’t, I clamped my mouth shut, carefully got up and headed toward the faculty bathroom on my hall. I was pretty positive at that point I was going to hurl and wanted to be sure I didn’t do it in my classroom. I got to the bathroom, leaned over the sink, and spit. The nausea passed, and I breathed deep and was thankful that I didn’t vomit. I went back to my room, suddenly tired and worn out, and tossed the walnuts out. No more raw nuts for me. I suppose perhaps it is too early in my sleeve’s young existence for such things. I also think I should probably roast the walnuts I still have so that I can freeze them and use them later. I was slightly disappointed, as I enjoy snacking on walnuts, pecans and almonds and really wanted to be able to eat a few each day. I guess I’ll have to stick to the almond butter I have. Not a bad thing, but just not as portable. So what have I learned today about sleeve life? No more trying new foods at school–I need to leave this exercise for home, where I can be sick if I need to be. No new foods in public, and probably no raw veggies just yet either. Raw fruits might be okay, as I ate a strawberry the other day without consequence, but raw veggies are another proposition entirely. Also? Because I got sick during the time of day I would take my short jaunt around the school, I didn’t get to do that today so I fell short of my step goal today. AND I forgot to take my calcium. Today was a self-care fail in all kinds of ways! This entry was posted in challenges, choices, daily bites, the sleeve, vsg and tagged challenges, choices, daily bites, post-op eating, post-op life, that was a bad choice!, vsg realness. Bookmark the permalink. Not a failure – a lesson learned! Now you know and now you will be further along on the road to taking care of your changing self. I am also very sad about the heat this weekend. No way you can go do anything outside. .